Safe Sedation Training – Deep (SSTdeep) was developed based on ASA guidelines for non-anesthesiologist physicians seeking credentialing and clinical privileges for deep sedation to ensure the highest standards in patient safety. 1. Recognize when a patient has entered a state of general anesthesia. 2. Maintain a patient’s vital functions until the patient has been rescued from general anesthesia and returned to an appropriate level of sedation. Mentored Practice: The objective of the mentored practice component is to include clinical experience on patients. It will also include a general and customizable framework for facilities to use to assist non-anesthesiologist physicians to acquire skills in deep sedation. Simulation Experience: The simulation experience will educate and assess the participant’s skills in deep sedation topics. Didactic Modules: A condensed, online and interactive training program that provides the tools, information and techniques needed to keep patients safe while administering sedation. Patient safety is of the utmost importance when administering sedation. 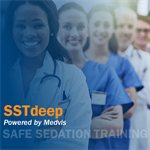 Safe Sedation Training - Deep Sedation (SSTdeep) was developed based on ASA guidelines for non-anesthesiologist physicians seeking privileges for deep sedation, to ensure the highest standards in patient safety. After completing the three SSTdeep components, you will be equipped with the skills needed to keep your patients safe. Mentored Practice - The objective of the mentored practice component is to include clinical experience on patients. It will also include a general and customizable framework for facilities to use to assist non-anesthesiologist physicians to acquire skills in deep sedation. Additional program details, questions about SSTdeep or if SSTmoderate has previously been completed through another organization other than ASA, please contact sstdeep@asahq.org. Faculty Information: Charles Anderson, M.D., M.B.A., Jeffrey Apfelbaum, M.D., Mark A. Singleton, M.D., Rebecca Twersky, M.D., M.P.H., John Allyn, M.D., Donald Arnold, M.D., Chair, Michael H. Wall, M.D., FCCM, Teodora Nicolescu, M.D., Amanda R. Burden, M.D., Randolph H. Steadman, M.D., M.S., John Rask, M.D., Beverly K. Philip, M.D. Planner, Faculty and Staff Disclosure: All individuals, including editors, authors, reviewers, and staff for the SSTdeep course reported they have no relationship(s) with commercial interests. System Requirements: A PC or tablet device (excluding iOS devices) that has the following: i) a modern web-browser such as Google Chrome, Mozilla Firefox (latest update), Safari, or Microsoft Edge, ii) Adobe Flash Player 11, iii) Broadband internet connection.